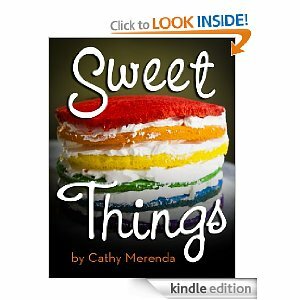 I finally got my book Sweet Things on Amazon Kindle! Dang, it was easier than I thought but it took a while to get there. So in June I put my book on iPad as discussed here. In September it was featured in the cooking section! It took a long time to figure out how to create a fixed-layout epub format book. Months, weeks, days and hours. But it was a learning process and you know how I love that. I initially layed out my iPad version of Sweet Things in Adobe inDesign then exported it as an epub. I unzipped the epub file and added the fixed-layout code to each page and re-formatted everything while testing on my iPad. So it was always my plan to convert my epub to mobi or whatever file format the Kindle takes. I was stalled. I couldnt figure it out. So what I ended up doing was taking my inDesign file and just changed the format of the pages and images from square (my epub ipad book) to rectangle (600 x 800) for Kindle. I exported it to PDF then imported using Mobipocket Creator. Once in Mobipocket Creator I filled in the metadata, added my cover image and then built my book (my hitting the “build” button). I then used my favorite learning method – trial and error – and tested my book on a Kindle (the cheap one). I put in pagebreaks, used h1, h2, h3 for my table of contents tags and built it again. With just a few more tweaks I was done! I uploaded the file to Amazon last night and it’s in the store now!! This entry was posted on Monday, November 21st, 2011 at 08:22. It is filed under Design, Food, Photography, Uncategorized. You can follow any responses to this entry through the RSS 2.0 feed.